Marchantia polymorpha is the best characterised liverwort plant. It is a common weed, and can grow quickly and resiliently. The relative simplicity of genetic networks in Marchantia, combined with the growing set of genetic manipulation, culture and microscopy techniques, are set to make this primitive plant a major new system for analysis and engineering. The plant is a weed-like, small and easy to culture in soil, other media, and in axenic in vitro culture. The thalloid liverwort is a descendant of earliest land plants, with the haploid gametophyte form dominant in its lifecycle. This allows the exploitation of haploid genetic systems, like microbes. Sexual reproduction in male and female plants can be induced by far red light. The gamete bearing structures are easily identified and used for crosses. A single genetic cross results in the formation of millions of spores, which are stable for >1 year. Spores will germinate and grow through the entire process of plant development in an entirely open fashion, accessible to modern quantitative microscopy techniques. Marchantia plants spontaneously produce vegetative propagules, called gemmae, which allow simple clonal propagation of lines. Gemma can be stored for 6 months as refrigerated stabs. Gemma are ideal tissues for microscopic analysis of early development, with defined simple morphology and ability to rapidly progress through key developmental and physiological stages after germination. The 280 MB genome sequence is available in draft form at phytozome.net (Tak-1) and marpoDB.io (Cam-1). 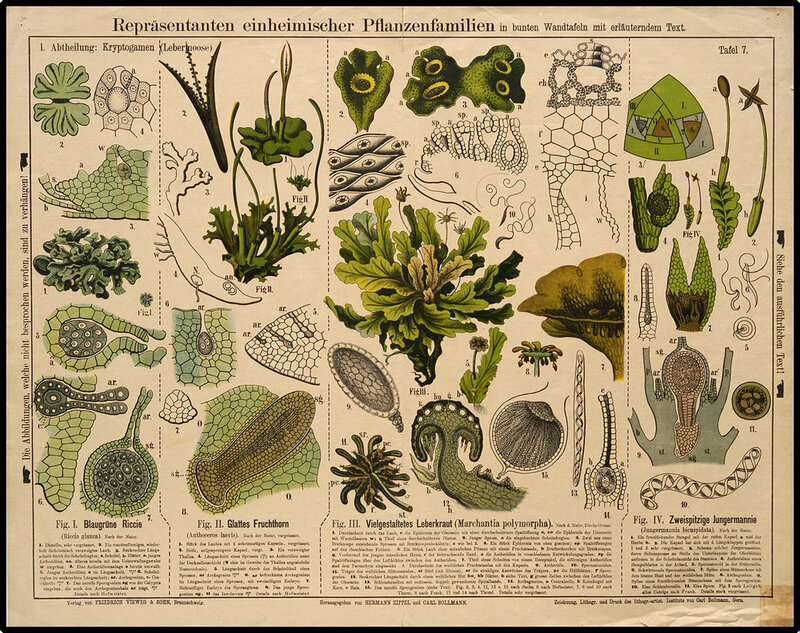 Compared to higher plants, Marchantia has a streamlined genome architecture, with reduced gene families. Isolated Marchantia tissues easily regenerate to entire plants during tissue culture, allowing efficient plant nuclear and chloroplast transformation. CRISPR-Cas9 based approaches for genome modification work efficiently and homologous recombination has been demonstrated in Marchantia.